Some sites have flash video’s online that play in your browser, if you have the correct plugins. Thanks to Veblin, I learned that these video’s are stored on your HD (most likely the Temp Internet Files), and that they (sometimes) have the .flv (FLash Video) extension. I wanted to try to convert to avi or mpg and could not find a guide on videohelp, so I did some research of my own. This is A way, it worked for me, and I would like to share it with you (helping this fine board to help others). which is freeware and it’s based on the FFMPEG encoder (normally it is used to create .flv files from .avi or .mpg, but it can do the reverse too). There is also FlixPro by Wildform, but that costs about $150. Download, install and open Riva. Klick the Browse button in the Input tab and locate the .flv file you want to convert. Klick the Browse button in the Output tab to select the location to save your output. Make sure you check the box Enable Audio or you’ll end up with a mute video. 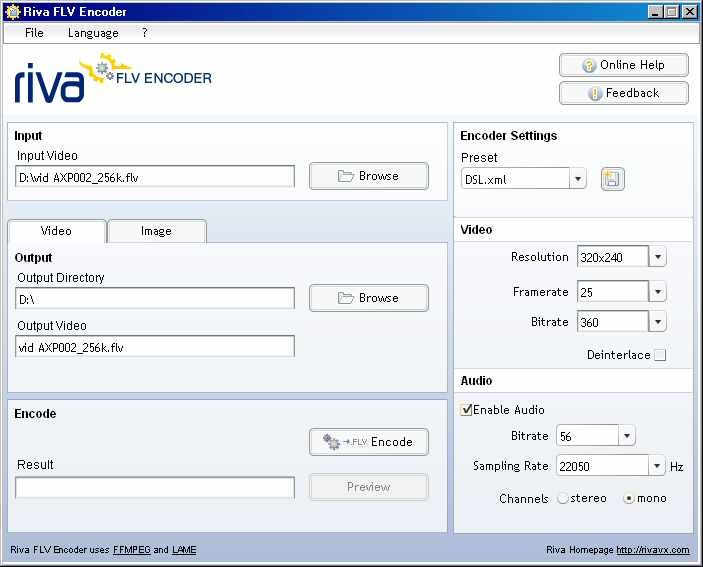 It’s possible that the .flv contains an audiocodec that will not be transcoded. A solution for that is to play the original .flv and record the audio with Audacity (for instance) and to mux that recording with the .avi or .mpg you get from Riva. Just experiment with the settings, but don’t expect miracles. When FFMPEG is done with the encoding, this window will close and (hopefully) you have an .avi or .mpg. The .avi is compressed with FFMPEG’s divx codec, as far as I know. Again, this is only a way of converting that I tried and it worked for me. It might be possible to use only FFMPEG, but I’m not familiar with it’s commandline, so I’m gratefull for the GUI of Riva. Someone out there might have a much better solution, but he/she did not post a guide. Special credits and thanks to Veblin of the streaming forum for pointing out some things to me. you must deselect "disable bbcode". click on edit on your post. Problem with Riva FLV Encoder is when converted to MPG, there is considerable loss in quality. Anything which keeps the quality???? You're going from equivalent of MPEG4 or better down to MPEG, some sort of quality LOSS and MASSIVE increase in size is expected. I can't get Riva to convert a flv to avi (seems like FFMPEG is not kicking in). I get sound, but no video. What am I doing wrong here? I tried Total Video converter also. It works, but it leaves an annoying watermark. holy cow, that's an awesome program!!!!! There are many tools can do it if it costs. It's true that the Riva FLV Encoder does a great job on converting FLV to Avi or Mpg, but not all FLV files are compatible. I recently download a FLV file that, while it plays perfectly, the Riva program can not convert it to neither Avi or Mpg. It gives out errors relating to codecs compatible and the such. I even tried CinemaForge and that program can't convert it either. Just to be sure that the Riva Encoder was still working correctly, I converted another FLV file without any problems. Which now proves to me that the problem is with that FLV file. Was this file made with a newer, updated codec? If so, then what would that codec be???? Is there a way to add updates to the FLV Encoder program? Or is there a better (Superior) program that can also convert FLV to Avi/Mpg but has the latest, newest codecs already installed? Super is a terrific tool for flv conversion! Thanks for posting this Baldrick! i used super but theres no sound, how can i fix this? I find that I'm having the same problem as cantckaja in that when I try to encode a file using SUPER, I can encode the video fine but the sound isn't encoded at all... Anybody know why this is so? when i try Riva, if i add ".mpg" it encodes mpeg-2 video, but no sound. if i add ".avi", i get MPEG-2 sound, but messed up (or NO) video. 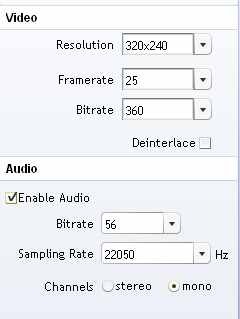 SOLUTION: encode BOTH, them "MUX" using VirtualDub with "Direct Stream Copy" for audio, choose vid codec for AVI. if you encode the MPEG2 file (in Riva) at 2000 kb/s, then re-enc using 1000 kb/s (or less as needed), it should turn out ok.
it converts OK! then i can do whatever with it. i think it was the "STEREO" setting that did it, but it's something to try! good luck all! I have two flash video files which are actually .exe files. Is it possible to convert those and how? Ai Haibara is right, Gregg, there are programs that can "extract" the SWF data inside other files, but it's rather cumbersome to learn, and quite a process at that! i gave up on trying to learn it after the first DAY! you can try if you like; try searching google for "swf extract" (in quotes), or something similar. you'd be better off though, trying Camtasia Recorder to just screen capture the video (and audio), for this situation. SWF .exe files weren't meant to be decompiled, but quite simply to provide an easy way to play SWF files without a separate player. your PC (P4 3.0Ghz correct?) should be able to handle the moderate load required to screen capture quite well, as i have a similar PC at home. im new to this program..
but why cant i choose flv files ? so how can i use this program to convert flv to avi?? which one better, Riva or Super? 1. be sure you're browsing in the proper folder (the one your FLV is in). 2. be sure your FLV has the .flv extension on it (sometimes you can download them without it adding an extension). 3. you can also drag & drop the file into Riva. this has worked for me. im looking for freeware to put audio in the video..
and i want to change the song in that video with other song..
do u know what software i can use to do so (to separate audio n video and then putting audio into that video)? anyways, VirtualDub works with both avi and mpeg files, however, it only CREATES avis. it's kinda tough to find a freeware MPEG editor, so if your file doesn't NEED to be mpeg, i'd stick with VDub. otherwise, you might try Womble MPEG Video Editor. it's one of the few programs that doesn't need to re-encode the video to add or delete audio files. so i can use Vdub to add or delete audio files from video? are there any guides here in regard to this? but basically, for what you need, once you've opened the file in VirtualDub, go to the Audio menu, and click "WAV Audio". then select the file you want to add. this will replace the current file. if you want it re-encoded, the "Compression..." option in that menu will do it. and then i have to open other file.What file do i need to open?the audio file? and what does re-encode mean? 1. open the original fanvid in VDub. 2. replace the existing audio (with your audio) by using the "WAV Audio..." option in the Audio dropdown menu at the top. oh, and if you are using an AVI file to start from, be sure to change the option to "Direct Stream Copy" under the Video menu. if there's anything you don't FULLY understand, you may either disregard it, or if you're TOTALLY lost (we've all been there), or just ask someone here! we're mostly pretty nice, but if you have anymore questions OFF the topic in this thread, of course, you should start your own NEW thread. Is there other tools except "http://www.flash-on-tv.com/index.php?sid=6 " to help flash work easily? How to record streaming flash video, edit and save as AVI, MP4, FLV,etc. Convert .FLV to another (.avi or .mpg) WITHOUT re-rendering?